We've spoken about both the Beagle Freedom Project and their campaign to help free the AstraZeneca beagles over the last few months. The Beagle Freedom Project rescues beagles, specifically those who have spent their lives in research labs as subjects. They find homes for these beagles, who have never known a proper home or a decent life. Their success stories are on YouTube, and news shows across the country. Many of you may have seen the videos of the so-called "Spanish 40" taking their first steps out in the real world. In fact, they just rescued a new group of dogs this week. We'll have more info soon. Spanish 40 beagles on their first night free. Photo courtesy of Beagle Freedom Project. I spoke with Beagle Freedom Project founder Shannon Keith about the work her group does, the current campaign to free the AstraZeneca dogs, and how pet lovers every where can help their work. How did you get into rescuing research beagles specifically? 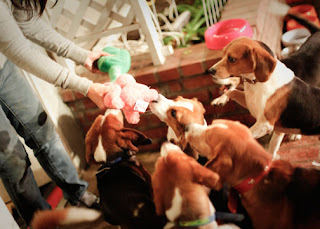 Rescuing beagles from research laboratories came by chance two years ago. My organization ARME (Animal Rescue, Media & Education) had been up and running for about six years and was focused on local Los Angeles rescue work with the over-crowded city shelter system, outreach events for a vegan lifestyle, legal assistance for persecuted activists, banning fur in West Hollywood, and making educational documentaries. A lab tech at a nearby company knew of my work and contacted me with the request I help find homes for two beagles that had been tested on and were to be otherwise killed. I of course accepted these two poor dogs into our program and filmed their release. The video captured the first 15 minutes of these beagles who were so curious but also so cautious about stepping out of their crates into fresh air, sunshine, and onto grass for the first time. How they gingerly walked, interacted with each other, and slowly warmed up to people whom would not hurt them was heartbreaking yet inspiring. This video went viral, changing the lives of a countless number of people and how they see animal-testing. From this point on Beagle Freedom Project became a central focus and the rescue, recovery, and re-homing of these mistreated dogs has done more to educate people about animal-testing and cruelty free shopping than anything else I have ever seen. How do you identify companies that have beagles that you might be able to save? Companies and universities that use beagles are all registered with the USDA and this information is publicly accessible. How do you approach those companies? We have sent a letter to all 380 laboratories across the US that use dogs inviting them to participate in our beagle retirement program. Each year there are over 70,000 dogs (almost all of them beagles) used for testing in the US. A good many of these dogs are needlessly killed at the end of the research and this should not be. Most companies and universities that have partnered with Beagle Freedom Project have come from a friendly advocate working inside the lab. Although they may disagree with us about the efficacy and ethics of using animals for research, they do share our principle of giving these dogs a chance at a normal life after all they have endured and suffered through for the sake of human products and corporate profits. 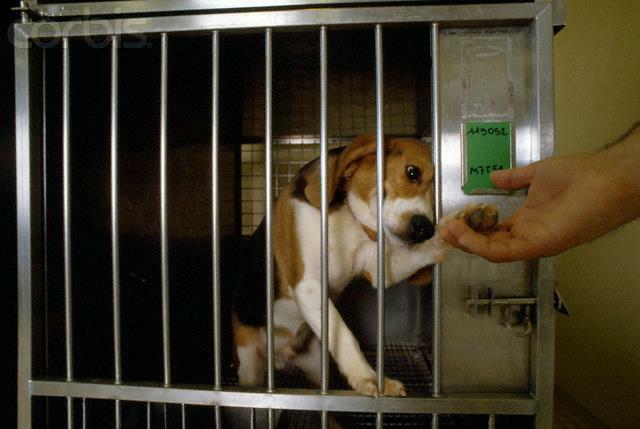 You've been able to save a lot of beagles from research labs. How successful would you be, would you say, in getting companies to turn these dogs over to you and partner groups? If we were able to get all the companies to turn over those dogs that did not die from the testing, we could confidently find homes for every one one of them! For example, when Beagle Freedom Project flew the 40 beagles from Spain to Los Angeles we received over 6,000 applications to adopt these little guys. Their plight and their stories of recovery touch a chord in people like few other issues. We are working hard for the day when retiring these dogs won't be necessary anymore because the labs will no longer be using them. How did you get involved with the AstraZeneca case? Beagle Freedom Project got involved with the AstraZeneca campaign reluctantly. I say this not because we do not share the goal of the coalition of animal protection groups across the world clamoring for their release, but because we thought we were going to be successful behind the scenes in our negotiations with the drug giant. When the news broke about AstraZenenca's Swedish beagle facility closing down we immediately reached out to representatives of the company. For about two weeks we traded daily emails and phone calls with various key AstraZeneca personnel, in each letter or call we would answer and alleviate a concern or question they had. When it seemed like the company could find no other objection to our program they abruptly cut off communication and we took our story public. One of the AstraZeneca beagles. Photo courtesy of Beagle Freedom Project. Where does that stand right now? Where things stand now are sad. Scores of the beagles have already been cargo shipped to the UK for further testing and will be killed by AstraZeneca at the end of their experiments or die during them. Every one of those beagles you see in those pictures is slated to die, after a prolonged period of poisoning first. We are tremendously disappointed in this company. We shouldn't be surprised, they have a global reputation for dangerous drugs that have killed many and have been sued repeatedly not only by individuals but also states and countries (like the US). To read part 2 of the interview, go here. Thanks so much for writing about this...It's really important. My ex actually works for a company that used beagles for cigarettes and was told not to have Maggie near the building due to press... disgusting. Trying my best on this side to help lab beagles. Thanks Maggie. I think those are the hardest pics I've seen so far, the ones of the dogs with the cigarettes. I saw a well-known trainer at Global Pet Expo, I won't say which, and he kept talking about how beagles were used to test cigarettes, so every time he sees one he jokes about how that dog could use a cigarette. He was an older gentleman, otherwise very nice, and British, and I know there's a whole other attitude about smoking there. Still, it took every fiber in my being to smile and not want to go crazy hippy all over him!